AMAZING. 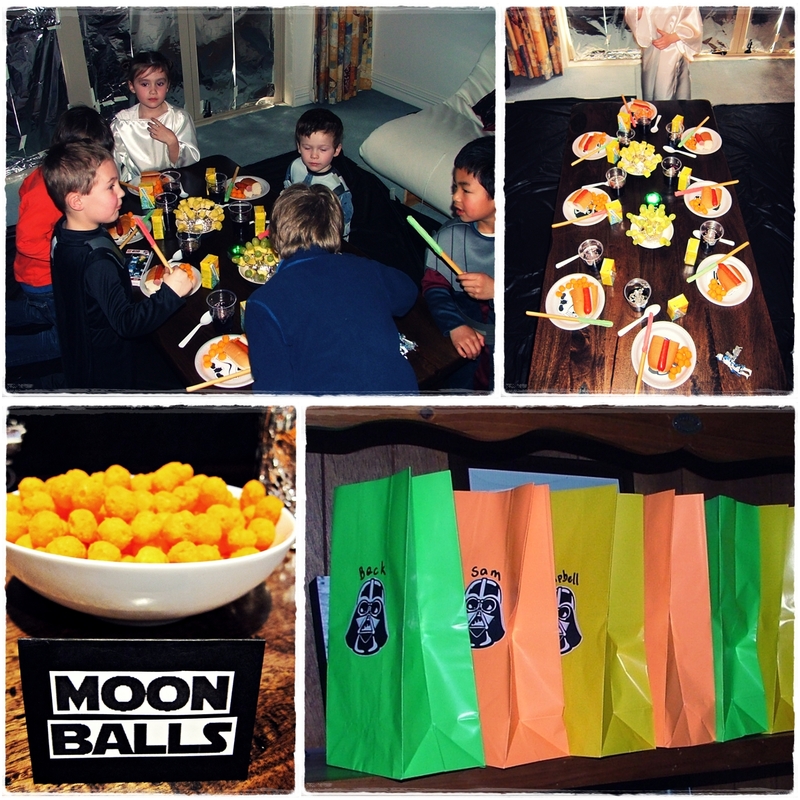 That's how Noah described his Star Wars party. Thank goodness for that! There was a lot of love and planning that went into this. Too much, some might say and Mark did say to me on more than one occasion. But then I'm not one to do anything by halves. If you're gonna do it, you might as well do it good. And I hope we did?! The baking commenced on Wednesday night (Mark's famous brownie), followed by the birthday cake Thursday night and cupcakes Friday night. The kitchen was a hive of activity especially on Friday night with black, grey and white icing flying in all directions. Saturday morning was all hands to the pump as we attempted to turn our lounge and dining room into outer space. First, we darkened the rooms by closing all the curtains and adding extra darkness with tinfoil, black crepe paper and cellophane in strategic locations. 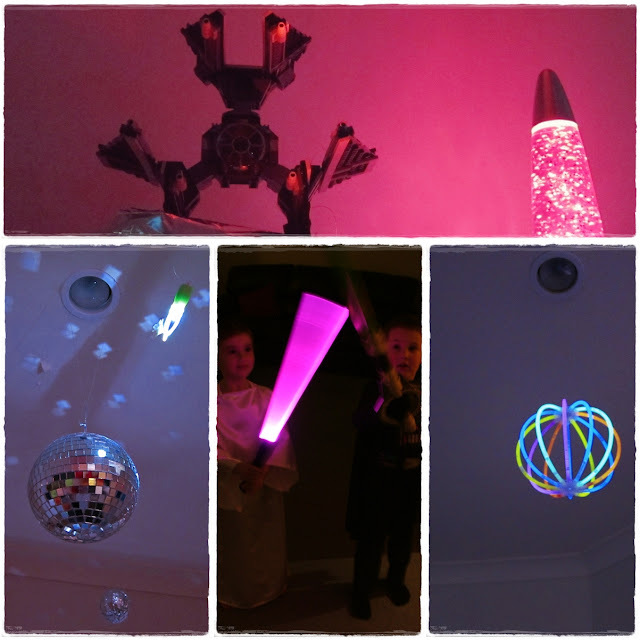 The ceiling was then covered in asteroids (tin foil wrapped around plastic ball-pit balls and held up with fishing wire), lego space ships suspended in space and glow in the dark balls. The food was appropriately themed for the day with Space Dogs (hot dogs), Lightsaber Sticks (bread sticks dipped in white chocolate coloured red or green), Jedi Jelly (blackberry jelly with silver balls melted into the top), Moon Balls (cheese balls), and Imperial Force cupcakes (cupcakes with Darth Vader and Storm Trooper ring toppers). Darth Vader was there (the guest of honour) with his brand new double light saber as well as Princess Leia - in fact she came in both a big and a small version! One of the dads also lent us his original Death Star fort and figurines for the kids to play with. Although the big kids were more intent on never-ending lightsaber fights, little Mylo was captivated and spent the entire afternoon hovering around it playing happily. 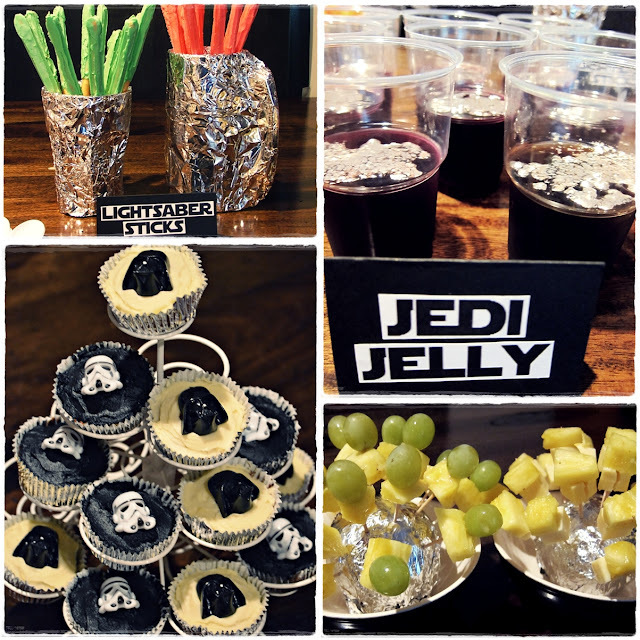 All the guests ate Jedi style around the table (on their knees), but like all kid's parties not much of the food got eaten in the excitement of it all...well at least it looked the part anyway! Darth Vader treasure hunt - the kids all went outside and had to find mini pictures of Darth Vader around the garden in their Jedi teams. Once all the pictures were found, they received their Jedi rewards. Even Bobba Fett made an appearance at the party on several different heads! Then it was time to sing Happy Birthday to Darth Vader. 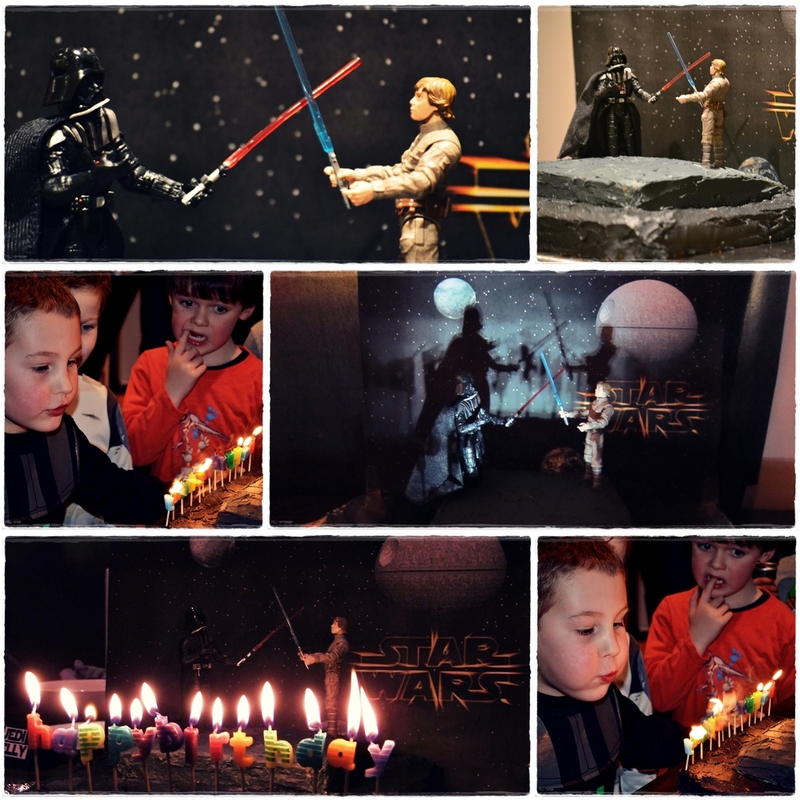 We loved how the cake turned out and how easy it was to make, just a plain square cake with a little bit sliced away to create a platform for the epic last battle scene in Star Wars. We coloured the top platform a little lighter than the bottom one and also printed a Star Wars scene to act as the backdrop to the battle. 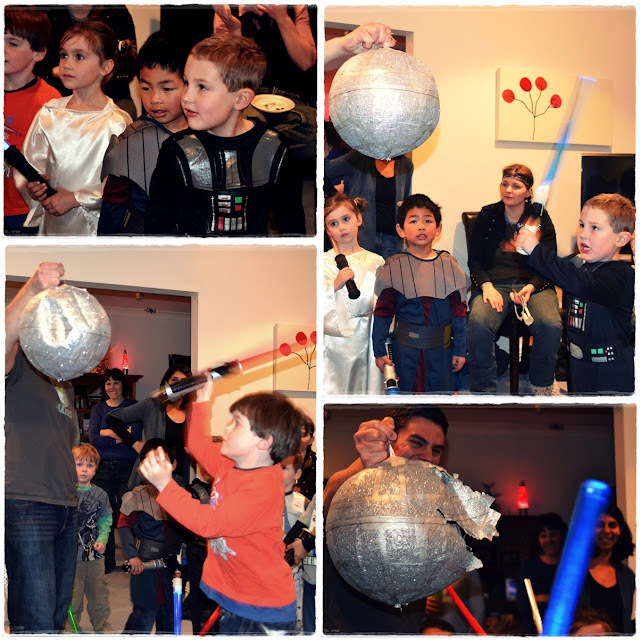 And then it was time for the final quest of the day - to smash the Death Star pinata (click on the link to find out How To Make a Death Star Pinata). We were a little concerned that with the four layers of paper mache it might be a little difficult (or impossible) to break. But the kids all gave out a great amount of energy and eye co-ordination and before long a few dents appeared on the surface. And within a few minutes, the Death Star crumpled and was no more, and all the goodness came tumbling out! And with that all the Jedi's, Imperial Force troops, Princesses and other little people were sent on their way high on sugar and happy times. 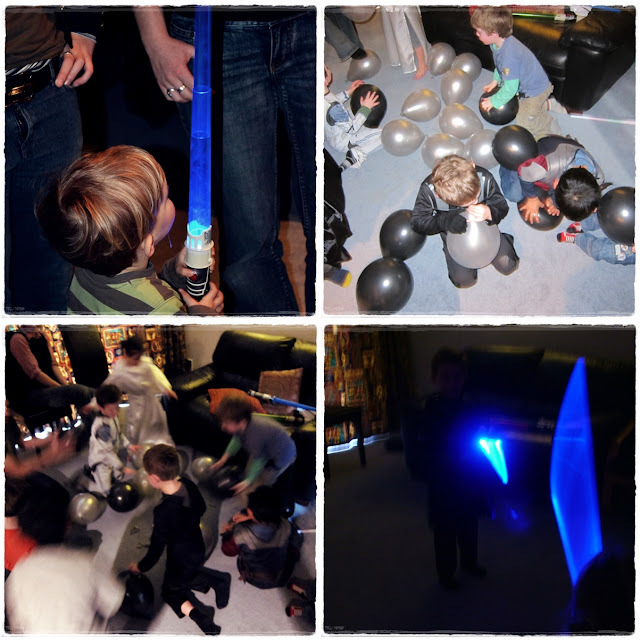 Special mention to Nana and Poppa for their help on the day, to Sarah Lee for the loan of the Storm trooper and Anakin costumes, and to both Sarah and Simone for their own great Star Wars party ideas here and here which paved our way! Now, if you'll excuse me, I might just go collapse in a corner somewhere for a couple of days! It looks so fantastic and sooo much detail, I love it! I LOVE the cake, with the scene behind it!! great idea!! And you are a gorgeous Princess Leia!!! WOW you party mummas are mindbogglingly AMAZING! absolutely brilliant! p.s you DO make a SUPER HOT princess Leia!! well done! Did you feel a little sad when started bashing your paper mache project to bits!? Agree with Widge on the super hot Princess Leia! haha. What an awesome party - love all of it!! 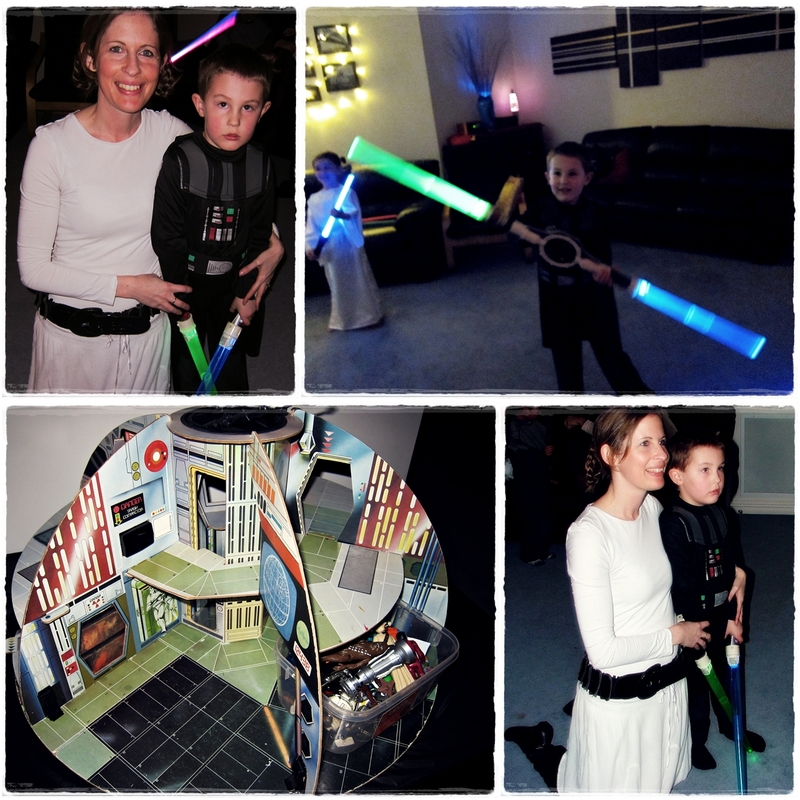 I love the games, the food and most of all that DEATH STAR pinata!!! Make sure you link this up to my party linky so others can find your awesomeness! WOW! It totally looks like all of your hard work has paid off - what an amazing celebration to throw your wee boy! That death star pinata - did you feel a teensy bit sad when it was bashed about??? You are the hottest Princess Leia EVER - go Mumma! What a cool party! 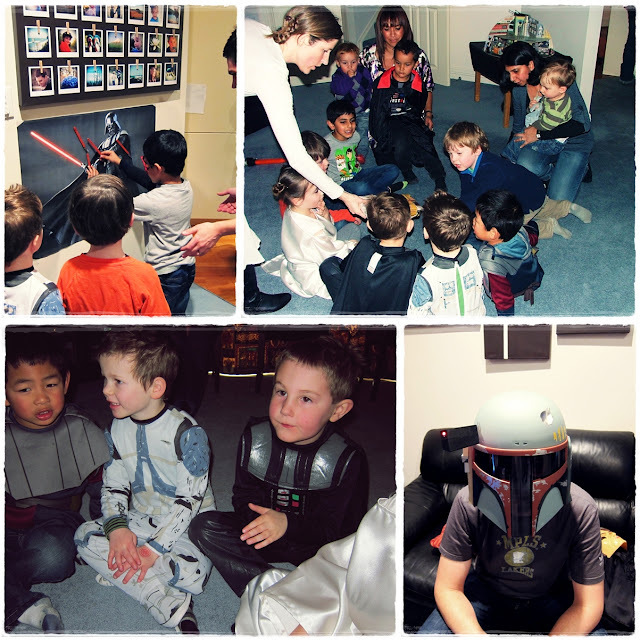 We had a Star Wars party last year for one of our boys, and I got to be Princes Leah too! 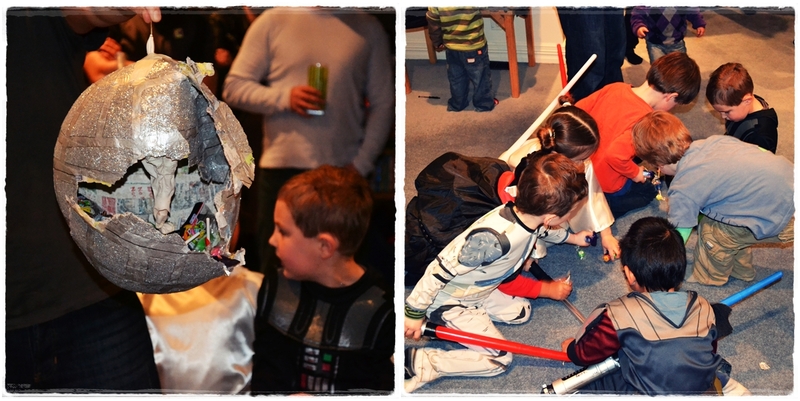 We didn't have the cool Death Star pinata though! AWESOME!!! That birthday will never be forgotten!!! What an amazing effort guys. Love it all. That was AWESOME! What a great effort, well done! The pinata was fantastic, my favourite part. And yes you are one hot Princess Leia! Well done!!! Wow! What a super party and lovely photos (looking gooooood Princess!). OK, so Leonie has planned my boy's next party and then this one came along and so he is wanting a star wars lego party now. hmm. Ohmygoodness you are an amazing mama!! Oh my goodness that's far to wonderful for words.